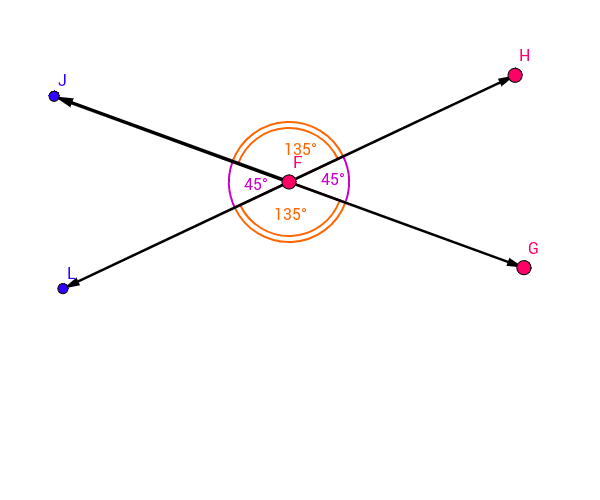 Drag G and H to change the angles. Answer the following questions in your notes. 1. <JFL and <HFG are vertical angles. Can you name another pair of vertical angles? 2. What do you notice about the measures of the vertical angles? 3. Is there ever a time when the vertical angles are not equal? ﻿Why do you think this happens? 4. Can you get all four angles to have an equal measure? ﻿If so, what kind of angles are formed?